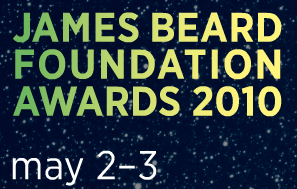 The James Beard Awards are always a big deal in food industry circles. But for us at The FCI the awards were an even bigger deal than usual. Having had our latest cookbook, The Fundamental Techniques of Classic Pastry Arts, nominated for a cookbook award in the category of Best Cookbook from a Professional Point of View, we were sitting on the edges of our seat, waiting to hear if we won or not. It was thrilling to everyone who worked so hard on putting together this resource (yes, that is you Pastry Department! ), filled with many of the recipes and insightful tips our pastry students learn while at the school. And, on Monday, former student Alexander Roberts ('93), Restaurant Alma, Minneapolis, won Best Chef: Midwest. We are so excited for him! It's always gratifying to watch our students do so well. What a great way to start off the month.